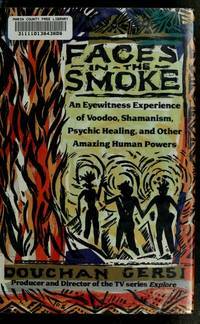 Faces in the Smoke: An Eyewitness Experience of Voodoo, Shamanism, Psychic Healing, and Other Amazing Human Powers. Los Angeles: Jeremy P. Tarcher, Inc., 1991. Not Stated Glossy Pictorial Wraps FINE in WRAPS 8vo (6 x 9), 223 pp. Trade paper Book is FINE -- unread and unmarked in FINE glossy pictorial wraps. The book also includes 16 pages of B&W photos of practitioners in places as far-flung as Yugoslavia, the Sahara, and Haiti -- and photos of ceremonies taken in Haiti. (h) Mr Gersi was producer and director of the TV series "Explore" Ihat ran in the 1980's using film footage he'd shot during his explorations the previous 20 years. This is his best-known book. 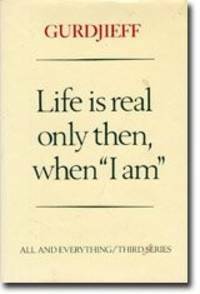 Life Is Real Only Then, When "I Am" (All and Everything / Third series). By Gurdjieff, G. I. (Preface by V. Anastasieff; Foreword by Jeanne de Salzmann). New York: Dutton , 1981. First Edition Thus 1/4 cloth AS NEW in AS NEW DJ 8vo (5-3/4 x 8-1/2), 177 pp. This is the revised enlarged 1978 edition -- the First Edition of 1975 was later revised to include 10 additional pages that had been printed in the 1976 Paris Edition. Book is Unmarked, Unread, and FINE -- AS NEW in AS NEW DJ. (DJ is pale yellow and spine has lightened from age and sun.) DJ is now in Bro-Dart cover. (h) This 3rd series of All and Everything follows "Meetings with Remarkable Men,' and takes the reader to a level in which he or she can perceive the world as it exists in reality. AN ENCYCLOPEDIA OF OCCULTISM; A Compendium of Information on the Occult Sciences, Occult Personalities, Psychic Science, Magic, Demonology, Spiritism, Mysticism and Metaphysics. New York: Strathmore Press, 1959. Reprint of 1920 Publication 1/4 cloth FINE in SLIPCASE 4to (8 x 10), 440 pp with Index, Bibliography, and Illustrations on coated stock preceding the listings. Book is Hardbound and FINE, Unmarked and apparently Unread -- has a previous owner's bookplate inside fron cover, otherwise appears AS NEW. In slipcase that looks Very Good and is complete but has been bumped and taped to keep edges from coming apart . (h) This is an historically major comprehensive treasury of Occult Knowledge with more rhan 2500 Entries from Ab through Zulu Witch-Finders.